That quote from Arsène Wenger came in December of last year, six months after Petr Čech had arrived at Arsenal from Chelsea. They say you never stop learning in life and clearly Wenger is an example of that. Since the departure of Jens Lehmann in 2008 Arsenal have been crying out for a new goalkeeper, to the extent they even re-signed the German three years after he left. But Wenger seemed content with trusting in youth or spending minimal amounts on new recruits to rectify the issue. Manuel Almunia arrived for £500,000. David Ospina cost £3.5m. Wojciech Szczęsny was promoted from the academy. To put it into context, Wenger spent over £6m on Andre Santos. That’s £2m more than he spent on goalkeepers. Perhaps they were not his priority? However, Čech’s arrival last summer marked a shift in that philosophy as Wenger spent £10m on a 33-year-old goalkeeper with one year left on his contract. Like Shakira singing about her hips, the stats don’t lie. Čech is fourth in the Premier League’s standings for goals conceded this season. He has the most cleansheets with 12 and the highest save percentage at 79%. According to Opta, Čech has made just one mistake which has led to a goal so far and that came on the opening day of the season against West Ham. Suddenly £10m looks like a bargain. But it is not just on the pitch that Čech is having an influence at Arsenal. Away from the bright lights of the Emirates the goalkeeper is having an affect too. Young goalkeeper Ryan Huddart has spoke about the benefit of working with his “idol”. Čech is not just improving his own game but those around him. Wenger too is glowing of Čech’s influence in all areas of the club. 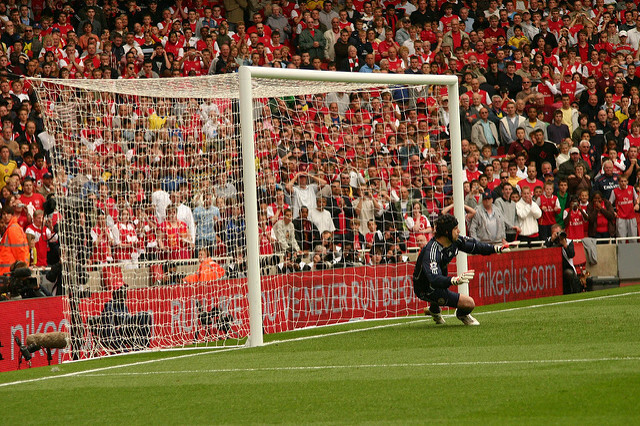 The Arsenal manager often talks about an aura the goalkeeper has. He describes him as being incredibly calm and charismatic. So complimentary is Wenger in his praise for Čech that you can tell a hint of regret lines his words. What if he had signed the Czech Republic international sooner? As is often the case with Arsenal and Wenger, it is a scenario that was not out of the question. Wenger admits he tried to sign Čech in 2004 before he left Rennes for Chelsea, but the Gunners were just pipped to the post. “Sometimes it makes me just think that I missed him when he was at Rennes, and how that could have changed for us if we had signed him in that period,” said Wenger. “There was no work permit issue or anything because he went to Chelsea from Rennes and we could have been quicker maybe on the day than Chelsea, especially because I know his agent very well. Arsenal’s loss was Chelsea’s gain, but now the tables have turned. Before Čech made the move across London in the summer his former captain John Terry warned the club’s board that the goalkeeper was worth 12 to 15 points a season. On the evidence so far Terry was absolutely right. Jose Mourinho was another who protested against the transfer. His displeasure may not have been as public as Terry but it would be foolish to think that the toxic nature at Stamford Bridge was not partly caused by Čech’s departure. What manager would be happy about strengthening a rival? The key to the deal was always Roman Abramovich though and the Chelsea owner’s love of Čech gave the goalkeeper a free choice. The 33-year-old was allowed to go wherever he wanted in exchange for his 11 years of loyal service to the Blues. London was the obvious choice for Čech. As stated he has spent over a decade in the capital and his family is very settled. Arsenal also offered the chance to challenge for major titles with Čech the number one from the off. There was too the small matter of a four-year contract worth £100,000-a-week. Now settled at Arsenal and showcasing the talent everyone knew he had, Čech looks like he was worth every penny and Abramovich’s admiration is understandable. The Russian really did hold the goalkeeper in a high regard, to the point where some say he saw him as a future manager at Stamford Bridge. It is a prediction which makes sense when Wenger explains his first meeting with Čech. “So since I have not been surprised, because I got the whole package in one go. Such a glowing reference from Wenger is a testament to Čech’s current influence but the mention of the goalkeeper’s knowledge is perhaps a hint towards the future. Such an intelligent and linguistically talented individual – Čech speaks Czech, English, French, German, Slovak, Spanish, and Italian, as well as basic Russian, Croatian, Serbian and Bosnian – would surely be management material? You just need to look at the respect Čech commands and the almost mesmeric calming affect he has on the defence. So while the goalkeeper is forging his growing reputation on the pitch don’t be surprised to see him joining the coaching ranks one day. Legend is strong term in football, but if the first eight months is anything to go by Čech can go down in Arsenal history. This entry was posted in NewsNow, The Bergy Blog and tagged AFC, Arsenal, Arsene Wenger, Champions League, Transfers, Wenger. Bookmark the permalink.